Glimitab-M contains two oral anti-hyperglycemic drugs glimepiride and metformin hydrochloride used in the management of type-2 diabetes (NIDDM). Glimepiride: The primary mechanism of action of glimepiride in lowering blood glucose appears to be dependent on stimulating the release of insulin from functioning pancreatic beta cells. In addition, extra-pancreatic effects may also play a role in the activity of sulphonylureas such as glimepiride. Metformin: Metformin improves glucose tolerance in patients with type-2 diabetes (NIDDM), lowering both basal and postprandial plasma glucose. 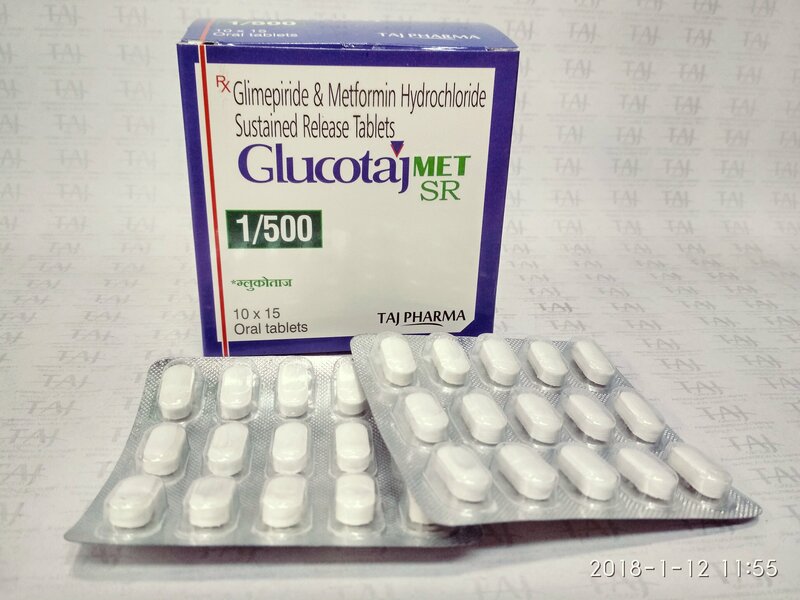 Metformin decreases hepatic glucose production, decreases intestinal absorption of glucose, and improves insulin sensitivity by increasing peripheral glucose uptake and utilization. Hence, the combination of glimepiride and metformin sustained-release complements each other and provides better glycemic control in management of type-2 diabetes and probably in the prevention of its associated macrovascular and microvascular complications. Glimepiride: After oral administration, glimepiride is completely absorbed from the GI tract. Studies have shown significant absorption of glimepiride within 1 hour after administration and peak drug levels (Cmax) at 2 to 3 hours. When glimepiride was given with meals, the mean Tmax (time to reach Cmax) was slightly increased (12%) and the mean Cmax and AUC (area under the curve) were slightly decreased (8% and 9%, respectively). Metformin sustained-release: The absolute bioavailability of a metformin 500-mg tablet given under fasting conditions is approximately 50-60%. Following a single oral dose of metformin sustained-release, Cmax is achieved within 4-8 hours. Peak plasma levels are approximately 20% lower compared to the same dose of metformin immediate release, however, the extent of absorption (as measured by AUC) is similar to immediate release. Both high and low fat meals had the same effect on the pharmacokinetics of sustained release. Glimepiride: After intravenous dosing in normal subjects, the volume of distribution (Vd) was 8.8 L (113 mL/kg). Protein binding was greater than 99.5%. Metformin sustained-release: Metformin is negligibly bound to plasma proteins, in contrast to sulphonylureas, which are more than 90% protein bound. Metformin partitions into erythrocytes, most likely as a function of time. Distribution studies with metformin sustained release have not been conducted. At usual clinical doses and dosing schedules of immediate-release metformin, steady state plasma concentrations of metformin are reached within 24-48 hours and are generally <1 μg/mL. During controlled clinical trials of immediate-release metformin, maximum metformin plasma levels did not exceed 5 μg/mL, even at maximum doses. Metabolism Glimepiride: Glimepiride is completely metabolized by oxidative biotransformation. The major metabolites are the cyclohexyl hydroxy methyl derivative (M1) and the carboxyl derivative (M2). Cytochrome P450 II C9 has been shown to be involved in the biotransformation of glimepiride to M1. M1 is further metabolized to M2 by one or several cytosolic enzymes. M1, but not M2, possesses about 1/3 of the pharmacological activity as compared to its parent; however, whether the glucoselowering effect of M1 is clinically meaningful is not clear. Metformin sustained-release: Metabolism studies with metformin sustainedrelease have not been conducted. However, intravenous single-dose studies in normal subjects demonstrate that metformin immediate release does not undergo hepatic metabolism or biliary excretion. Excretion Glimepiride: When 14C-glimepiride was given orally, approximately 60% of the total radioactivity was recovered in the urine in 7 days and M1 (predominant) and M2 accounted for 80-90% of that recovered in the urine. Approximately 40% of the total radioactivity was recovered in feces and M1 and M2 (predominant) accounted for about 70% of that recovered in feces. No parent drug was recovered from urine or feces. Metformin: Intravenous single-dose studies in normal subjects demonstrate that metformin is excreted unchanged in the urine and does not undergo hepatic metabolism or biliary excretion. Renal clearance of metformin is approximately 3.5 times greater than creatinine clearance, which indicates that tubular secretion is the major route of metformin elimination. Following oral administration, approximately 90% of the absorbed drug is eliminated via the renal route within the first 24 hours, with a plasma elimination half-life of approximately 6.2 hours. In blood, the elimination half-life is approximately 17.6 hours, suggesting that the erythrocyte mass may be a compartment of distribution. INDICATIONS GLUCOTAJ Met is indicated as an adjunct to diet and exercise to improve glycemic control in patients with type-2 diabetes who are already treated with a combination of glimepiride and metformin or whose diabetes is not adequately controlled with metformin alone, or for those patients who have initially responded to glimepiride alone and require additional glycemic control. DOSAGE & ADMINISTRATION General Dosage should be individualized on the basis of both effectiveness and tolerance. The combination should be given once daily with meals and should be started at a low dose. The initial recommended dose is one tablet once daily with breakfast or first main meal of the day. Starting dose for patients inadequately controlled on metformin monotherapy GLUCOTAJ Met-1 or GLUCOTAJ Met-2 may be initiated once daily, and gradually titrated after assessing the therapeutic response. Starting dose for patients who initially responded to glimepiride monotherapy and require additional glycemic control Based on the initial starting dose of glimepiride (1 or 2 mg), GLUCOTAJ Met-1 or GLUCOTAJ Met-2 may be initiated once daily, and gradually titrated after assessing the therapeutic response. Starting dose for patients switching from combination therapy of glimepiride plus metformin as separate tablets GLUCOTAJ Met-1 or GLUCOTAJ Met-2 may be initiated based on the dose of glimepiride and metformin already being taken. Maximum Recommended Dose The maximum recommended dose for glimepiride is 8 mg daily. The maximum recommended daily dose for metformin sustained-release is 2000 mg in adults. CONTRAINDICATIONS • Renal disease or renal dysfunction, as suggested by serum creatinine levels ≥1.5 mg/dL [males], ≥1.4 mg/dL [females] or abnormal creatinine clearance, which may also result from conditions such as cardiovascular collapse (shock), acute myocardial infarction, and septicaemia. • Hepatic impairment. • Known hypersensitivity to this product or any of its components. • Acute or chronic metabolic acidosis, including diabetic ketoacidosis, with or without coma. Diabetic ketoacidosis should be treated with insulin. • Patients undergoing radiologic studies involving intravascular administration of iodinated contrast materials, because the use of such products may result in acute alteration of renal function. WARNING & PRECAUTIONS Cardiac effects The administration of oral hypoglycemic drugs (tolbutamide) has been reported to be associated with increased cardiovascular mortality as compared to treatment with diet alone or diet plus insulin. In view of close similarities between the oral hypoglycemic drugs, this warning also applies for glimepiride. Lactic acidosis Lactic acidosis is a rare, but serious, metabolic complication that can occur due to metformin accumulation during treatment with glimepiride and metformin combination therapy; when it occurs, it is fatal in approximately 50% of cases. When metformin is implicated as the cause of lactic acidosis, metformin plasma levels >5 μg/mL are generally found. The reported incidence of lactic acidosis in patients receiving metformin hydrochloride is very low (approximately 0.03 cases/1000 patient-years, with approximately 0.015 fatal cases/1000 patient years). Reported cases have occurred primarily in diabetic patients with significant renal insufficiency and congestive heart failure. Lactic acidosis is a medical emergency that must be treated in a hospital setting. In a patient with lactic acidosis, metformin should be discontinued immediately and general supportive measures promptly instituted. Because metformin hydrochloride is dialyzable, prompt hemodialysis is recommended to correct the acidosis and remove the accumulated metformin. All sulphonylurea drugs are capable of producing severe hypoglycemia. Proper patient selection, dosage, and instructions are important to avoid hypoglycemic episodes. When a patient stabilized on any diabetic regimen, is exposed to stress such as fever, trauma, infection, or surgery, a temporary loss of glycemic control may occur. At such times, it may be necessary to withhold the diabetic regime and temporarily administer insulin. The oral antidiabetic therapy may be reinstituted after the acute episode is resolved. Alcohol is known to potentiate the effect of metformin on lactate metabolism. Patients should be warned against excessive alcohol intake, while receiving metformin. Treatment of patients with glucose 6-phosphate dehydrogenase (G6PD) deficiency with sulfonylurea agents can lead to hemolytic anemia. Since glimepiride is a sulfonylurea agent, caution should be used in patients with G6PD deficiency and a non-sulfonylurea alternative should be considered. Abnormal blood glucose levels during pregnancy are associated with the higher incidence of congenital abnormalities. Most experts suggest insulin be used to maintain the blood glucose levels as close to normal as possible. The use of glimepiride and metformin combination is not recommended for use in pregnancy. Studies in lactating rats show that metformin is excreted into milk and reaches levels comparable to those in plasma. Similar studies have not been conducted on nursing mothers. Also Glimepiride should not be used by breast-feeding mothers. Hence, the use of glimepiride and metformin combination is not recommended for use in lactating mothers, and if the diet alone is inadequate for controlling blood glucose, insulin therapy should be considered. Safety and effectiveness of glimepiride and metformin combination in pediatric patients have not been established. Metformin is known to be excreted by the kidneys, and because risk of serious adverse reactions to the drug is greater in patients with impaired renal function, glimepiride and metformin should be used only in patients with normal renal function. Because aging is associated with reduced renal function, glimepiride and metformin combination should be used with caution in the elderly. Cationic drugs: Certain medications used concomitantly with metformin may increase the risk of lactic acidosis. Cationic drugs that are eliminated by renal tubular secretions (e.g: amiloride, digoxin, morphine, procainamide, quinidine, ranitidine, or vancomycin) may decrease metformin elimination by competing for common renal tubular transport systems. Hence, careful patient monitoring and dose adjustment of metformin/cationic drug is recommended. Miconazole (systemic route, oromucosal gel) and Phenylbutazone (systemic route): Increases hypoglycemic effect of glimepiride. Furosemide: A single-dose, metformin-furosemide drug interaction study in healthy subjects demonstrated that pharmacokinetic parameters of both compounds were affected by co-administration. Furosemide increased the metformin plasma and blood Cmax by 22% and blood AUC by 15%, without any significant change in metformin renal clearance. When administered with metformin, the Cmax and AUC of furosemide were 31% and 12% smaller, respectively, than when administered alone, and the terminal half-life was decreased by 32%, without any significant change in furosemide renal clearance. Vitamin B12: Metformin may result in suboptimal oral vitamin B12 absorption by competitively blocking the calcium dependent binding of the intrinsic factor- vitamin B12 complex to its receptor. The reaction very rarely results in pernicious anemia which is reversible with discontinuation of metformin and supplementation with vitamin B12. Nifedipine: Nifedipine appears to enhance the absorption of metformin, it increases plasma metformin Cmax and AUC by 20% and 9% respectively and increases the amount of metformin excreted in the urine. Danazol: If the use of this active substance cannot be avoided, the patient’s urine and blood glucose must be monitored. It may be necessary to adjust the dose of glimepiride and metformin during and after treatment with danazol. Salicylates: If salicylates are administered or discontinued in patients receiving oral antidiabetic agents, patients should be monitored for hypoglycemia or loss of blood glucose control. Thiazide: Interactions between thiazide diuretics and oral antidiabetic agents decreases insulin sensitivity thereby leading to glucose intolerance and hyperglycemia. Hence diabetic patients should be monitored closely. Other: Concomitant administration of angiotensin enzyme inhibitors (captopril, enalapril), other antidiabetic drugs (insulin, acarbose) beta-blockers, fluconozole, monoamine oxidase inhibitors (MAOIs), sulphonamides and NSAIDs, increases sensitivity to insulin and potentiates blood glucose lowering effect and may in some instances, cause hypoglycemia. Patients receiving estrogens or oral contraceptives, phenytoin, quinolones should be closely monitored for loss of diabetic control. Gastrointestinal disturbances: Nausea, diarrhea, abdominal pain, constipation, vomiting and metallic taste in mouth may occur. These reactions are generally dose related and disappear when the dose is reduced. Dermatological effects: Rash, puritus, urticaria, erythema & flushing. Hematologic Reactions: Leukopenia, agranulocytosis, thrombocytopenia, hemolytic anemia, aplastic anemia, and pancytopenia have been reported with sulfonylureas, including glimepiride. Metabolic Reactions: Hepatic porphyria reactions and disulfiram-like reactions have been reported with sulfonylureas, including glimepiride. Cases of hyponatremia have been reported with glimepiride and all other sulfonylureas, most often in patients who are on other medications or have medical conditions known to cause hyponatremia or increase release of antidiuretic hormone. The syndrome of inappropriate antidiuretic hormone (SIADH) secretion has been reported with sulfonylureas, including glimepiride, and it has been suggested that certain sulfonylureas may augment the peripheral (antidiuretic) action of ADH and/or increase release of ADH. Hypoglycemia: Glimepiride appears to be associated with a low incidence of hypoglycemia. Although Glimepiride has the potential to produce adverse cardiovascular effects, glimepiride has been an established agent for the treatment of type-2 diabetes for a number of years without producing adverse cardiovascular effects. Overdosage of sulfonylureas, including glimepiride, can produce hypoglycemia. Mild hypoglycemic symptoms without loss of consciousness or neurologic findings should be treated aggressively with oral glucose and adjustments in drug dosage and/or meal patterns. Close monitoring should continue until the physician is assured that the patient is out of danger. Severe hypoglycemic reactions with coma, seizure, or other neurological impairment occur infrequently, but constitute medical emergencies requiring immediate hospitalization. If hypoglycemic coma is diagnosed or suspected, the patient should be given a rapid IV injection of concentrated (50%) glucose solution. This should be followed by a continuous infusion of a more dilute (10%) glucose solution at a rate that will maintain the blood glucose level above 100 mg/dL. Patients should be closely monitored for a minimum of 24 to 48 hours, because hypoglycemia may recur after apparent clinical recovery. Lactic acidosis is a rare, but serious, metabolic complication that can occur if metformin accumulates during treatment due to overdosing. Strict monitoring should be continued until the doctor is sure that the patient is out of danger.